An Apples to Apple Comparison? 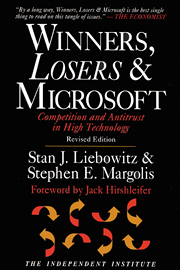 Those of you who have been around the economics department the last few years have probably had a brush with Winners, Losers, and Microsoft, where Stan Liebowitz and Steven Margolis examine the antitrust case against Microsoft from the late 1990s. Krugman in trying to understand the iPhone relies on network effects (people have apps and are locked in) but apps are so cheap it is hard to imagine this is anything remotely the same as that in the past. Krugman also considers Apple high priced but that is very recent. Before the followers came in, Apple’s iPhone was significant precisely because it was so cheap compared to other proposed smart phones. The same is true of the iPad. Indeed, that gives us the current narrative. Competitors can use price to compete with Apple (which they couldn’t do with the old Microsoft). Apple, therefore, has to keep quality high and consumers satisfied to survive. That is precisely why the share market has such a hard time with it than with say Amazon that arguably relies more on switching costs to keep its customers. The important point is that that is what we want in the tech world. We want competition on the basis of price and quality and we want it to be tough. In many respects, therefore, we have the free from monopoly cost market that we tried to get in the 1990s and should be happy for it. Continue reading An Apples to Apple Comparison? 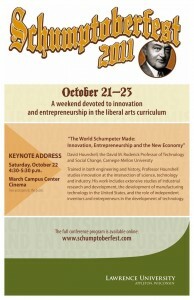 We’ve received late notice that the Colorado College is hosting its 2nd Annual Research Symposium, and we are invited. Can’t get out to CC in an expeditious fashion? Well, come join me in Briggs 223 where I will stream a few of the presentations LIVE. There are a couple of presentations on innovation, capped off with the big kahuna himself, Dan Johnson, talking about some sort of esoteric bidding system. The Spring Economics Reading Group will feature the astonishing Winners, Losers, and Microsoft: Competition and Antitrust in High Technology by Stan Liebowitz and Steven Margolis. The book is more about competition in high technology than it is about Microsoft itself, and it was written back when people still used VHS players and Apple was a bit player in the computer market (pun possibly intended). This book is tried-and-true. Last year students gave it rave reviews as the featured reading for the Economics Senior Experience, and we also read it in my Industrial Organization this past term. If you happened to have already read it, don’t despair, I am compiling an auxiliary set of readings to complement (and update) the Liebowitz and Margolis book. Indeed, the group discussion might be the ideal setting for you to augment your knowledge of the knowledge economy. We will meet Thursdays from 11:10 to 12:15, provisionally in Briggs 217. As the title implies, once potential cause is that new innovation is simply not bringing the value added to world economic growth — advances such as the internet, iPhones, LED holiday lighting and the like are a lot more hat than they are cattle, so to speak. We have seen this stagnation argument from economists such as Tyler Cowen and Robert Gordon. There are certainly those who believe that the wellsprings of science are running dry, and that, when one looks closely, the latest gadgets and ideas driving global commerce are essentially derivative. But the vast majority of my scientist colleagues at top universities seem awfully excited about their projects in nanotechnology, neuroscience, and energy, among other cutting-edge fields. 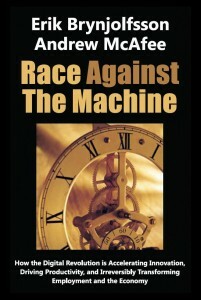 They think they are changing the world at a pace as rapid as we have ever seen. Frankly, when I think of stagnating innovation as an economist, I worry about how overweening monopolies stifle ideas, and how recent changes extending the validity of patents have exacerbated this problem. Overweening, an underused word if ever there was one. But the point is solid — the economics profession since at least Schumpeter has fretted about the tradeoffs between providing incentives and the deadweight losses of monopoly power. For some, that isn’t really the point anymore, as we learned reading Liebowitz and Margolis last year, as they focus on the serial monopoly phenomenon especially as it relates to high tech. Nonetheless, it’s certainly the starting point and these are the types of questions that aren’t likely to go away. Although there is some disagreement amongst economists, many argue that traditional monetary and fiscal policy will not take the US economy from its current relatively stagnant state to the robust growth needed to employ many of the 8 million who were unemployed during the recent recession as well as the new entrants into the labor force. As those in Intermediate Macroeconomics learned, since we add roughly 1.5 million people to the work force each year, we need about that number of jobs just to keep unemployment from worsening. 1. Provide a permanent capital gains exemption to investment in startups held for at least five years. 3. Reduce Sarbanes-Oxley requirements for firms with less than $1 billion in market capitalization. 4. Subject federal regulation to 10 year sunset. 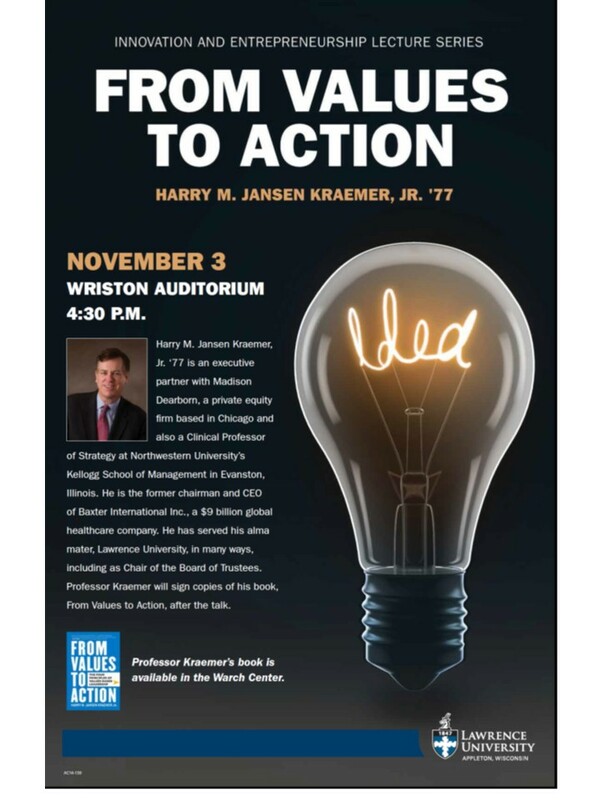 Carl Schramm and Robert Litan, on behalf of the Kauffman Foundation also argue for removing the caps on skilled immigrants and immigrant driven entrepreneurial ventures. These are intriguing ideas. They should encourage Lawrence students to sample our Innovation and Entrepreneurship courses. Check out Schramm and Litan’s presentation last week to the National Press Club. Jason Kottke has some interesting thoughts on “How to Beat Apple.” Does this read like a page out of Clayton Christensen’s playbook? Apple also has some weak spots which a canny competitor should be able to exploit to make compelling products that Apple won’t be able to duplicate or directly compete with. 4. I can’t remember if this is my own theory or I read about this on Daring Fireball or something, but the Apple products & services that Apple does well are the ones that Steve Jobs uses (or cares about) and the ones he doesn’t use/care about are less good (or just plain bad). Might make for an interesting discussion over in one of those innovation classes I hear so much about. I’m a bit behind on both my reading and on updating this blog, so I wanted to point to a series of fascinating articles at David Warsh’s Economic Principals blog. The first resulted from his trip to Denver for the American Economic Association meetings in early January, where he sensed a possible resurgence of interest in the history of economic ideas. This possibly rings true for those of us plodding through Capitalism, Socialism, and Democracy this term. Warsh followed up this dispatch from the AEA meetings with a most interesting piece on how the big brains of the profession are thinking about technological innovation and climate change. The piece starts with another dispatch from Denver, and traces its way back through the cold war to the RAND Corporation (and one of my heroes, Armen Alchian) and beyond. The piece touches on the contributions of Kenneth Arrow and Richard Nelson, now are both familiar names to anyone interested in the economics of innovation. And if that’s not enough, this week’s column looks at Paul Samuelson and hedge funds, another hat tip to the history of thought that includes David Ricardo’s Waterloo. If nothing else, the blog seems to get its principals right. I also continue to recommend Warsh’s Knowledge and the Wealth of Nations: A Story of Economic Discovery — an excellent pick for the summer reading list.